They were planted last Friday and we have had consistently good temperatures in the 80's during the day. Dropping to around 50 for a few hours in the early morning before warming back up. Both plants are green bells. I've noticed that they have developed some blackish spots at their "joints" where stems are meeting. Seems to be mostly the top set where it's most noticeable and closer to the ground nothing and in the middle less severe. Nothing on the main stems, only at the joints. No signs of any insects. They otherwise look fine and are growing up nicely and even put out some flower buds I pinched off. Is this some sort of fungal issue or indication of over/under watering? They've been getting one good drink around 3PM when I get home from work. Little warmer then I'd like when watering but I've been trying to do it early so they have plenty of time to dry off before nightfall. Also just for a side note since I am posting anyway. Being as they are trying to put out buds already, whats a good rule of thumb for size before I start letting them put out fruit? Should I continue to pinch buds until they reach a certain size and time after transplant? Or will they continue to grow even after setting fruit and I should just let them do their thing? I would venture to say that the darker coloration is a natural part of maturity for pepper plants under good lighting conditions. Usually purplish black color. Some of my pepper stems are completely purple up to a certain point. Any thoughts to my second question regarding the flower buds? Do I keep pinching them off until the plant is more established and reaches a certain height or do I just let it do it's thing and set fruit when it decides it's time and it'll keep growing while it's at it? I'm thinking you'll want to let it set fruit unless your plants are REALLY small, because they're going to shut down production when it gets hot -- especially where you are -- and will sulk until the cooler weather comes back. I never pinch the flowers off mine because I don't have a very long growing season for peppers -- not warm enough for a long time in spring, then too hot too soon, then short autumn season before frost. Last fall, I brought 2 sweet peppers and 1 Jalapeno plants inside and coddled them through the winter. I have one that is doing well and fruiting in my kitchen window in a 12" pot. The 8" pot struggled. 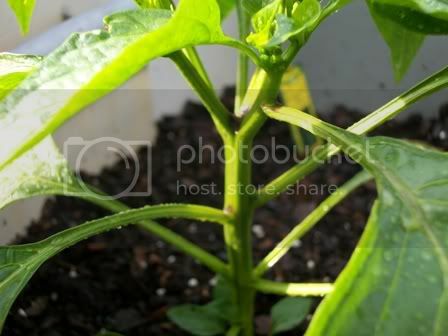 The Jalapeno plant is doing well in a 9.5" pot. Definitely doing this again this fall. Last edited by applestar on Wed Apr 07, 2010 3:25 pm, edited 1 time in total. Thanks Apple. I'll leave the next round of buds to their own designs and not pinch um off. Totally normal. I too use to think this was an issue, but this is just what pepper plants do depending on variety of course. The weather couldn't be any better for them right now . 50's in the morning and 80's during the day, those plants are loving it. Right now I am experimenting with a pepper plant under a wall o water, right now our lows are in the low to mid 30's and our highs are 50 and 60's. I hope it'll do fine. Just testing if I should plant them all out now with wall o water. Good luck with the peppers! S'all good Lupe. Love the sig line; I've read a lot of Heinlein. Is that from "Stranger In A Strange Land?" It's been a while. My personal fav is "The Moon Is A Harsh Mistress". I'm glad I stumbled onto this thread. The leaves of some of my pepper plants that are under the light are turning purple and I was hoping that it was normal. Brian, I wish you luck with your early pepper plants. 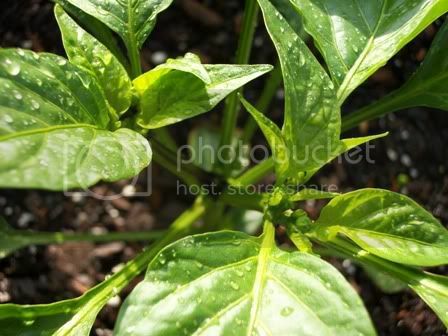 Although, I must warn you that I hear if you plant a pepper plant in cool soil, you can stunt its growth for the entire season. I'm not sure how true this is, though. 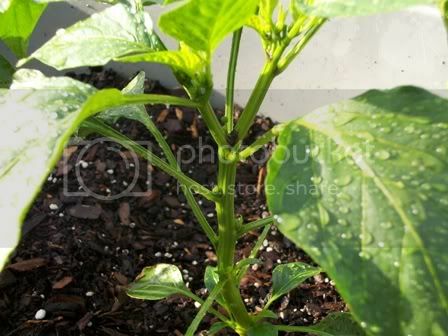 When is the best time to put out pepper plants, as in high and low temperatures? Since my last frost date is the middle of May, I'm thinking June 1 should be good. *Problem with peppers* Leaf diagnosis test. Pics included.